On Wednesday, I put up my reviews of the big films of the week – Creed, The Good Dinosaur and Trumbo. I also had two reviews of some fine independent films published on Hammer to Nail: Barge and Lost Colony. Enjoy! Who was Dalton Trumbo? Do you know? If not, you should. A somewhat arrogant, self-important cuss, he was nevertheless one of the most important Hollywood screenwriters of the middle of the 20th century, made immortal by his leading position among the “Hollywood Ten” (as well as by his penning of films like Kitty Foyle, Our Vines Have Tender Grapes and Spartacus, among others), those left-leaning writers and directors (9 former, 1 latter) called before the House Committee on Un-American Activities (HUAC) in 1947 to answer questions about their political affiliations past and present. “Are you now or have you ever been a member of the Communist Party?” barked Committee Chairman J. Parnell Thomas (soon to be indicted on financial corruption charges). When they refused to answer, citing their First Amendment rights to believe and say whatever they so chose, they were cited for contempt of Congress. Many would later serve jail sentences. “How could that be?” you may ask. “Aren’t we a free country?” Well, yes, you’re right, but keep in mind the vagaries of human nature and remember that this was the start of the Cold War, in which our erstwhile allies, the Soviets, were now morphing into our enemies, and anything deemed ideologically similar to their professed views was suspect. As we see today, humans are never immune from fear of difference, so Trumbo’s story offers lessons just as valid in 2015 as they were in the 1950s. This is by no means a perfect film. It has the usual pitfalls of the biopic: it elides historical events, creates composite characters out of multiple real ones, and oversimplifies many of the issues it portrays in its attempt to fit the whole story within the demands of the Hollywood three-act structure template. That said, Trumbo does a wonderful job with the big picture, clearly presenting the reasons behind the blacklist that resulted from the HUAC hearings; a blacklist which denied many in the film industry the chance to work, tarnished as they were by the Communist label. As written by John McNamara (with many TV credits to his name, including “Aquarius“) and directed by Jay Roach (with credits from Austin Powers to Meet the Parents to Game Change), the movie offers a combination of light satirical humor and hard-hitting political critique. It may, in fact, be the best mainstream dramatic retelling of this period in Hollywood history (The Front, with Woody Allen, notwithstanding), warts and all. Much of the credit for the film’s success lies with its lead, Bryan Cranston (“Breaking Bad“), who brings Dalton Trumbo’s signature bluster and stubbornness to vivid life. He’s assisted by a fine ensemble cast that includes Diane Lane (Man of Steel), Helen Mirren (Hitchcock), Alan Tudyk (42), Elle Fanning (Maleficent), Michael Stuhlbarg (Steve Jobs), Louis C.K. (Blue Jasmine) and many more. We believe in all of Trumbo’s qualities as a human being, both good and bad. He was a clever son of a gun, and as we watch him slowly write himself out of post-prison penury, taking work on the sly to avoid the scrutiny of nosy gossip columnist Hedda Hopper (Mirren), we believe that only this man could really have beaten the blacklist through sheer force of will. It’s a terrific performance in a film not always worthy of it – with one too many scenes of purely expositional dialogue – and it holds our attention as the real Trumbo must have held that of his peers. See it for him and for an easy primer on a terrible period in American history. Just don’t take it as actual history. It’s a movie, after all. Back in 2013, first-time feature director Ryan Coogler wowed the independent film world with his harrowing and extraordinarily thoughtful movie about the 2009 murder of Oscar Grant III by Oakland transit police, entitled Fruitvale Station (after the Bay Area Rapid Transit, or BART, station where Grant was killed). Born in 1986, Coogler is not yet 30, and here he comes with a second – much bigger – movie, Creed, about the son of the great fictional boxer Apollo Creed (from the Rocky films). Starring Michael B. Jordan (Grant in Fruitvale Station), the film treads much the same territory as that of every other boxing film ever made (you know, stuff about how your most dangerous opponent is YOU), recycling materials (and character arcs) from the original Rocky, as well, yet has such heart and spirit that in spite of its lack of originality is terrific fun to watch. Unless you don’t like boxing movies. In which case, what are you doing in the theater? It’s an unusual step for a relatively young and untested director to take, for sure. Creed is not quite a franchise film, yet does qualify as a spin-off, even bringing Sylvester Stallone back as Rocky; quite a feat, considering how happy the Italian Stallion was with the way Rocky Balboa, in 2006, had concluded the series (according to The New York Times, anyway). At first it may seem far-fetched to imagine the filmmaker behind such an intimate drama like Fruitvale Station tackling well-known universe, but as the film progresses, it quickly becomes clear that the protagonists of both stories share a lot in common, and not just because they’re played by the same actor. Adonis Creed – Apollo’s son – is a boy in a man’s body, struggling to mentally grow into his physical size and join the adult world. Where Jordan’s Oscar Grant has his mother as a needed mentor, his Creed has Rocky; both need guidance to navigate the pitfalls of responsibility. And both have a supportive woman (of course, what successful cinematic man doesn’t?) by their side (as did Rocky). Anyone who doesn’t know how this particular film is going to end has not been paying attention to the signpost markers. Just as in the first Rocky film, there’s a preening self-involved antagonist for our hero, who refuses to acknowledge the underdog’s validity as a contender. Just as in the first Rocky film, there’s the woman urging her man to be better. And just as in the first Rocky film, there’s a trainer doing his best to get the young wannabe ready for the big fight. There’s no question that it’s a great twist that Rocky is now the grizzled veteran, but lay the first film side by side with Creed and it’s hard to distinguish the two. Except, you know, that now our main guy is African-American, which could have allowed Coogler – African-American, himself – to discuss issues of race in the boxing world. But he doesn’t. So what we’re left with is an entertaining riff on a popular boxing legend, but a riff compromised by formula (aren’t riffs usually more improvisatory?). Coogler and Jordan (and even Stallone) most definitely confirm their talents here (though poor Tessa Thompson, from Dear White People, has nothing to work with); I just wish that talent had been used in service of something truly new and fresh, upholding the promise of their first collaboration. Here’s hoping for Round 3! Sadly, the rest of the movie does not come close to this level of wit. As a big fan of the Pixar œuvre (I loved this summer’s Inside Out), I had high hopes. That was my undoing. The Good Dinosaur rewards low expectations. It offers all of the (sometimes cloying) cuteness we have come to expect from both Disney and Pixar over the years, with none of the originality. If Bambi, The Lion King and Cars got together and had a script baby, this is what it would look like. Also, be forewarned if you plan to bring young children: there is a fair amount of trauma on screen, more than usual for this kind of movie. If you have sensitive kids, they may be unhappy. Worse than the recycled coming-of-age plot is the nonsensical world building. What would dinosaurs be like if they had lived on and developed sentience? Apparently, even without opposable thumbs, they would be like us, only green. They would live in houses and till the land. How much more interesting this movie would have been had the writers exercised their imaginations and developed reasons for their story choices. Remember Monsters, Inc? There, the filmmakers created an entire alternate universe where new rules of logic applied, explained those terms early on, and then created a movie which mined this unexpected new world for much of its humor. Here, we meet Arlo, young misfit who must learn to be a man – excuse me – adult male dinosaur – by finding his way home once lost. As happens in these kinds of stories, he picks up a sidekick along the way – a human, as it turns out (who behaves, for some reason, like a canid) – who helps him learn important life lessons. Sound familiar? Exactly. Inside Out, in contrast, was so much more brilliant in its plotting, and it just came out on disc on November 3. Here’s an idea: this Friday – the day after Thanksgiving – treat yourself to a Black Friday purchase of the Blu-ray or DVD of that film while avoiding this new one. Unlike last week, I actually had a lot going on this week – check out my podcast with Dan Rodricks, my Dragon Digital Media TV show and my reviews of Brooklyn, The Hunger Games: Mockingjay – Part 2 and Spotlight – but I still managed one review for Hammer to Nail, on Amy Scott’s terrific documentary Oyler. Enjoy! Christopher Llewellyn Reed, “Reel Talk” host, w/ Jed Dietz, Director the Maryland Film Festival. Welcome to the second episode of the 2015-2016 season of Dragon Digital Media‘s Reel Talk with Christopher Llewellyn Reed (you can watch the first episode here). My guest this time was Jed Dietz, Founding Director of the Maryland Film Festival. We reviewed three films, as usual – Brooklyn, Room and Spectre – and added an additional segment where we discussed the history and films of the Maryland Film Festival. In Howard County, Maryland, you can watch the show on Channel 41 (if you’re a Verizon customer) or Channel 96 (if you’re a Comcast customer), and you can watch it online from anywhere. As always, the amazing Dragon Digital Media team did a fantastic job putting this together, especially producer Karen Vadnais and director Danielle Maloney. Our next episode will premiere in January of the new year. Until then, if you want to watch more of our work, you can check out last year’s episodes in full – Episode 1, Episode 2, Episode 3, Episode 4, Episode 5, Episode 6 – or watch the various segments from each episode on our YouTube channel. Enjoy! And we’ll see you at the movies! In January, 2002, journalists at the Boston Globe published a lengthy exposé of the long-term abuse of children by Catholic priests in the Boston Archdiocese. Though the Catholic Church had long denied that it had a problem with pedophiles, claiming that the occasional molestation cases were merely the results of actions by individual priests, the depth of the reporting in the Globe‘s series proved otherwise, and led to a global realization that the Church had long covered up a culture of sexual abuse of minors, spawning articles in publications far and wide. Dawning horror rightly followed, and we have seen, since then, a lessening of the prestige and infallibility at the root of the Church’s power. Less than a year after the first article ran in the Globe, Boston’s Cardinal Law – once seen as infallible, himself – resigned. True, he quickly found a home at the Vatican, but for him to step down in disgrace in a majority Catholic city speaks to the power of the press … at that time, anyway (ah, 2001 was so long ago …). And now we have a film about this epic piece of journalism, directed by master independent filmmaker Tom McCarthy (The Station Agent), who actually starred as a reporter, himself (albeit an unscrupulous one), in Season 5 of HBO’s “The Wire.” With great patience and attention to detail, McCarthy chronicles the hard work done by the four-person investigative team known as “Spotlight.” The look and feel of the film mirrors the day-to-day drudgery of the research these men (and one woman) needed to go through in order to dig up the necessary materials for the piece. The procedural nature of McCarthy’s direction is almost pedestrian – this is unsexy stuff, folks – which would qualify as a negative if that aesthetic weren’t so essential to this particular movie. From the way the journalists dress to the no-nonsense camera work that refuses to draw attention to itself, this is quality filmmaking that places the facts and emotions of the story front and center. The only thing I didn’t like was Howard Shore’s score, which was mostly distracting and not at all needed; these scenes require no soundtrack. The ensemble cast is excellent. Michael Keaton (Birdman), Mark Ruffalo (Infinitely Polar Bear), Rachel McAdams (Southpaw) and Brian d’Arcy James (“Smash“) all star as the members of the Spotlight team, while John Slattery (“Mad Men“) and Liev Schreiber (“Ray Donovan“) are the editors. Schreiber is Marty Baron, the first Jewish editor of the Globe, a fact stated a few times in the film and used to imply (by his detractors) that, of course, this man would have it in for the Church (it’s Baron’s idea to pursue the topic in the first place). Boston, like most big cities, merely masquerades as a cosmopolitan place; at its heart, it’s as insular as any small town, and as protective of its own. Stanley Tucci (Julie and Julia) shows up as a lawyer representing the victims, and, as an ethnic Armenian, drives this point home again: only an outsider would be able to take such a hard look at the facts. Spotlight is a movie that not only tells us the important story of how one driven group of people took down a major institution, but also makes the case for why journalism matters in a democracy. As we have seen since 2001, our major newspapers have suffered major decreases in subscriptions and have yet to find a truly new way forward – in terms of earning revenue – in the digital age of the internet and social media. Clickbait is the word of our day, and while the Church’s abuse scandal is just as lurid as any headline you might see in your Facebook “trending” feed, the reason why the Globe’s reporters were able to make such a difference is because they had the full support of their superiors, who at that time could afford to pay the salaries of four people dedicated, over many months, to uncovering the truth about one topic. As we move forward, it’s worth considering the price we pay, as a society, for the free content we access every day online. Truth is worth paying for. Even in the times when Brooklyn – a new film by Irish director John Crowley (Closed Circuit), based on the 2009 best-selling novel of the same name, by Irish author Colm Tóibín – doesn’t quite work, it still firmly holds our attention, thanks to the mesmerizing central performance by lead (also Irish – Erin go bragh!) actress Saoirse Ronan (Atonement). 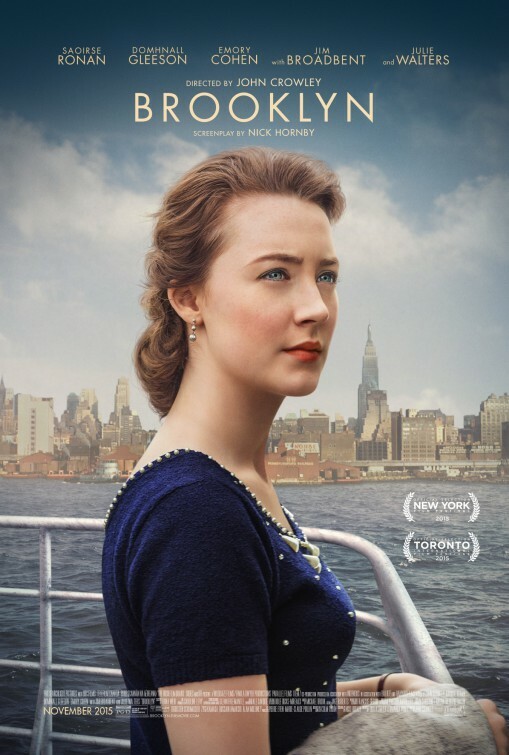 And those times are few and far between, since this lovely period piece about a young woman’s migration from the Emerald Isle to the Big Apple in the early 1950s tackles big, universal issues about the human condition in small, concrete ways that make the tale accessible to all. Who hasn’t left home to find their way in the world, only to wonder at one’s place in it? Beautifully photographed and (mostly) brilliantly acted, the movie is a gentle coming-of-age story that showcases a young star on the rise. I have not read Tóibín’s book, so I do not know how faithful is this adaptation – written by novelist-turned-screenwriter Nick Hornby (Wild) – but I can say that the script moves along briskly, starting first in Ireland, where twenty-something Eilis (Ronan) lives with her widowed mother and older sister. That sister, Rose, has arranged for Eilis (pronounced “Aye-lish”) to emigrate to America (New York, specifically). There’s nothing for her at home, and Rose insists on a better life for Eilis than what she has for herself. We move quickly past the tearful goodbyes, on to the boat, and then before we know it we’re on Ellis Island, and then in Brooklyn, where Eilis finds herself in an Irish-run boarding house, homesick beyond belief. By day, she works in a department store, doing her best not to cry in front of customers. The kindly Irish ex-pat priest (Jim Broadbent, Le Week-End) who organized her travel realizes that Eilis needs a calling, and sets her up in night classes at Brooklyn College, where she studies to become an accountant. Slowly, Eilis acclimates to her new life. And then one day, she meets a young man, Tony (Emory Cohen, “Smash“) – not Irish, but Italian – and things improve even more. Perhaps Brooklyn will offer Eilis the opportunities of which her sister dreamed. The film features an impressive ensemble cast, especially in scenes in the boarding house, where an array of new Irish immigrants is overseen by the delightfully prickly Mrs. Kehoe (Julie Walters, Mrs. Weasley in the Harry Potter films). While everyone in the film – Irish and Italian, alike – is somewhat of an ethnic caricature, these portrayals make sense as evocations of how foreign ethnicities might be seen through the eyes of other new immigrants. Unfortunately, the one performance of which I am (slightly) less of a fan is Cohen’s. While his Tony is sweet and loving, and perhaps just what Eilis needs to soothe her loneliness, I never for one moment buy him as an adult male about to make his way in the world. Plus, his adoption of “Eye-tal-ian” mannerisms – in contrast to the more subtle behaviors of the actors playing the other members of his family – is a bit much. And though I am usually no fan of Gleeson’s, his restrained lovesick (and manly) rival to Tony, back in Ireland, creates an imbalance in favor of a return to Eire, which is not, I believe, the filmmakers’ intent. That issue, aside, however, the film is superbly done, and a powerful portrait of a strong female protagonist coming into her own. It has now long become de rigueur to take successful book series and prolong their cash-cow (or golden-goose … pick your animal metaphor) cinematic adaptations by splitting the final volume into two movies (to say nothing of Peter Jackson’s slicing and dicing of the slim Hobbit into three movies): this process began with Harry Potter, continued with Twilight, is perpetuated with the Hunger Games, and will no doubt live on with the next installment of the Divergent series. There’s nothing wrong with Hollywood wishing to make money; after all, movies are expensive to make, and there’s nothing like pre-awareness to bring the audiences to the megaplex. Unfortunately, though, if their raison d’être is purely mercenary, then it’s unlikely that these films will possess the dynamic narrative drive needed to sustain tales of derring-do and adventure. It is no surprise, therefore, that the latest (and, we hope, final) installment in the Hunger Games series is mired in bog and bloat. That is not to say, however, that there are not strong passages within. But at 137 minutes, this is not a lean machine (though, dark in tone as it is, it sure is mean). Do you remember how the last film ended? If not, I recommend you bone up – if you care – by watching it again or reading a plot summary, as Mockingjay – Part 2 begins in medias res, expecting us to know what just happened … last year. Here’s a friendly reminder: Peeta Mellark, brainwashed by the Capitol, tried to kill the erstwhile love of his life, Katniss Everdeen, by strangulation. Peeta has been played by Josh Hutcherson (The Kids Are All Right), since the series began, with an appealing combination of vulnerability and resolve. Katniss is played, of course, by Jennifer Lawrence (Silver Linings Playbook), also with vulnerability and resolve (and arrows). After surviving a series of unspeakable ordeals – including participating in winner-kills-all games for the entertainment of the country’s elite – Katniss and Peeta are ready, with the same faithful companions of the previous films, to take the fight all the way to President Snow (Donald Sutherland, Pride & Prejudice, consistently one of the best parts of these films). Much blood will be shed, but freedom comes at a cost. What I liked about the previous installment – Mockingjay – Part 1 – was how the filmmakers played with the idea of film-as-propaganda to both market their movie and draw attention to those very marketing techniques. The same logos that we saw on the posters and trailers in our (real) world were used on the rebels’ own “propos” (promotional trailers for the resistance) in the world of the film. In a franchise that had shown real fire and energy in its second entry (appropriately entitled Catching Fire) after a dismal start, but was already showing signs of fatigue within the first hour of its third segment, this clever self-reflexive device made the enterprise more bearable. In Part 2, it would be nice to see that idea advanced in some new direction. Instead, it’s just more of the same. Individual set pieces entertain and thrill – I particularly enjoyed a sequence with a flood of oily water that hardens into blade-like shapes when touched – but there’s no sense of urgency to the overall mix, in spite of repeated claims to the contrary by the characters. Visually, there’s very little new, as well: I sighed when the “mutts” (hybrid human-canine creations) appeared, only to look like a cross between the alien of Alien and the zombies of, well, everything since 28 Days Later. And then there’s the fact that the movie refused to end. True, the final (weakest) book offered multiple conclusions, as well, but over only a few pages; here, we get at least 15 minutes of false resolutions, including one not in the original text that led to groans amongst the audience of the screening I attended. By no means is this a terrible film; there is far worse out there, franchise-wise (Fantastic Four, anyone?). It is not, however, particularly good, though I suspect that fans of the series will, overall, have little to complain about. “The fire will burn forever,” reads the tagline. Perhaps, but remember that peat fires burn the longest of any, to no great result.